The Self-Employed Women’s Association (SEWA) is an internationally respected organization that has vast expertise in organizing the poor and self-employed women. With over 1.7 million members and an international network in 15 countries and growing, SEWA emphasizes the importance to social empowerment through economic enablement, and the ability of women leaders to work while maintaining the family unit. 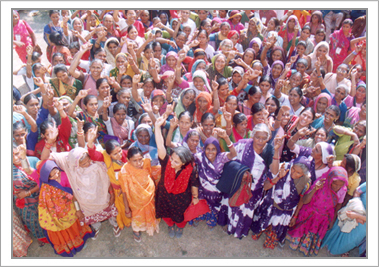 SEWA’s mission is to achieve full economic sustainability and self-reliance for its members. Founded as a trade union in 1972, the organization has grown into a family of sister organizations. These sister organizations are distinct, but collaborate with one another similar to the hanging roots of the Banyan tree dynamically interwoven stretching down to ground. SEWA and its movement practice the Gandhian philosophy of simplicity, honesty, non-violence, and self-reliance, which is its philosophical foundation and strength. In the four decades of its formation, SEWA’s organizational structure has grown to include the SEWA Bank, SEWA Academy, SEWA Trade Facilitation Center, SEWA Ecotourism, SEWA Insurance, SEWA Manager Ni School, and several other initiatives.